French socialist and writer; born at Nîmes June 22, 1836; died at Marseilles Dec. 1, 1871. 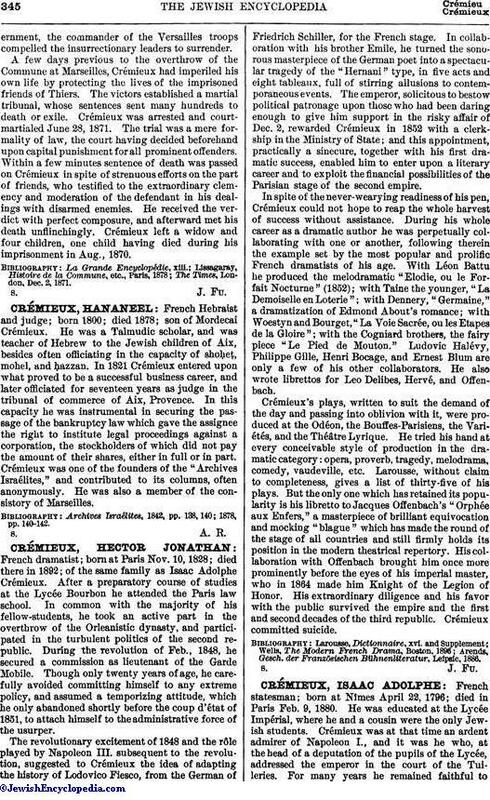 He entered upon an active career as attorney and counselor at law at Aix in 1856, after having taken all the honors at the lyceum of Nîmes; but after two years spent in a fruitless effort to acquire a remunerative practise, he returned to his native town, where his generosity in dealings with impecunious clients soon procured him the honorable appellation of "Avocat des Pauvres." In the spring of 1862 Crémieux was admitted to the Marseilles bar, and then and there started upon an aggressive political and journalistic campaign against Napoleon III. and the centralizing and reactionary tendencies of his régime. Crémieux's audiences consisted largely of working men, to whom he preached the most advanced political and economic theories of international socialism. The International Working Men's Association, established in London in 1864, found in him a tireless worker. As a participant in an insurrection against the local authorities (Aug. 8, 1870), Crémieux was arrested and condemned to six months' imprisonment; but he was subsequently freed by the revolution of Sept. 4, and was made procurator of the republic at Marseilles. His handsome, youthful exterior and the broad philanthropic range of his ideas made him one of the most conspicuous figures in the public life of southern France. At the outbreak of the Paris Commune, Crémieux declared himself for the rebellious Parisians and against Thiers and the Versailles government. On March 23 the insurrection in favor of communal home rule took the department of Bouches-du-Rhône by storm; and Crémieux was elected president of a provisory departmental administration. Radical though he was, he was firmly opposed to extreme measures involving useless bloodshed; and he thus incurred the displeasure of his fellow revolutionists. On the twenty-eighth of the same month the department was put under a state of siege; and the Commune of Marseilles took a desperate step in arresting and threatening the lives of a number of prominent upholders of the reactionary government. On April 4 the central government at Versailles sent Gen. Espivent de la Villeboisnet against the rebellious town, enjoining him to resort to the most energetic measures. By a heavy bombardment of the prefecture, the seat of the self-styled communal government,the commander of the Versailles troops compelled the insurrectionary leaders to surrender. A few days previous to the overthrow of the Commune at Marseilles, Crémieux had imperiled his own life by protecting the lives of the imprisoned friends of Thiers. The victors established a martial tribunal, whose sentences sent many hundreds to death or exile. Crémieux was arrested and court-martialed June 28, 1871. The trial was a mere formality of law, the court having decided beforehand upon capital punishment for all prominent offenders. Within a few minutes sentence of death was passed on Crémieux in spite of strenuous efforts on the part of friends, who testified to the extraordinary clemency and moderation of the defendant in his dealings with disarmed enemies. He received the verdict with perfect composure, and afterward met his death unflinchingly. Crémieux left a widow and four children, one child having died during his imprisonment in Aug., 1870. 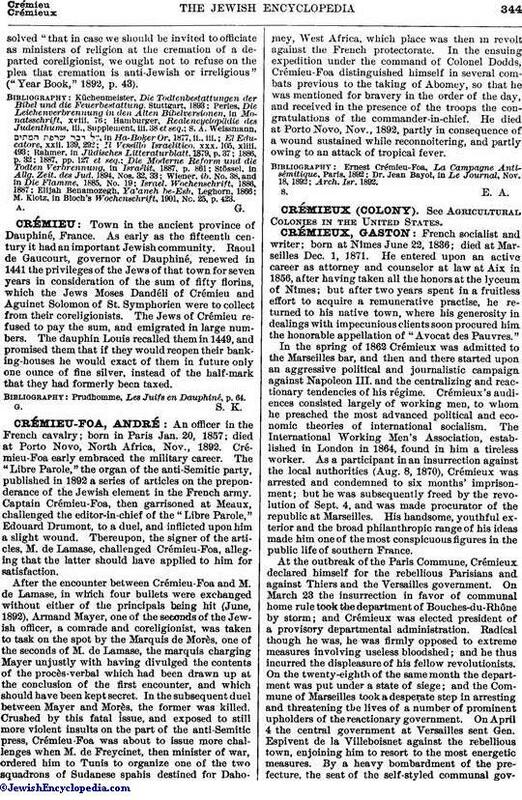 The Times, London, Dec. 2, 1871.